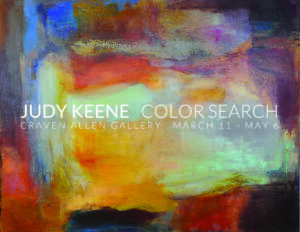 While the inspiration of abstract expressionist and color field painters is readily apparent in Judy Keene’s paintings, with their luscious surface textures and enigmatic compositions, less obvious may be her study of the palettes and paints of Renaissance artists. Keene’s professional background in the museum world has given her an appreciation for the subtle color harmonies of old master paintings; she even crafts some of her own pigments from raw materials. Keene’s paintings range in scale from intimate small works to expansive large scale canvases. Craven Allen Gallery is proud to present the first major show of her work. Resonant color is the core of my process. I juxtapose luminous passages of saturated color with more muted tones. I work primarily in oils on linen canvases from small to large. Using palette knives and large and small brushes I combine forms of opaque color with transparent glazes. By varying the thickness of the paint and applying many layers of glaze I experiment with the subtlety of lost and found edges and work to achieve luminosity through value shifts. I hope my color investigations will be enhanced by a study of Old Master materials and methods. My work is informed by the traditions of painterly abstraction. I was first introduced to Abstract Expressionism and Color Field Painting by art historian Shirley Blum in California. For ten years I worked in art museums and continued to draw and paint and resumed painting full time in the mid-80’s. I paint intuitively allowing shapes to appear and dissolve under layers of pigment and glaze, building on the compositions of previous works in a continual search for balance and unity. I have been influenced by the work of Pierre Bonnard, Mark Rothko, Helen Frankenthaler, Joan Mitchell, Wolf Kahn and many contemporary abstract painters. Currently I work at home in a beautiful natural setting where our pond and the changing seasons are a continual inspiration. Judy Keene is an abstract oil painter living and working in Durham, North Carolina. Born in Texas in 1946, she travelled throughout the West with her parents in childhood, visiting many national parks. Her father, a prospector of rare and precious metals, instilled in her a love of rocks, geology and varied landscapes. Her mother, a teacher, instilled a love of reading, music and sewing. She studied painting and drawing in high school and college and graduated in art history from the University of California, Riverside, in 1969. Her senior seminar with art historian Shirley Blum was an introduction to the active contemporary art scene in the late 60’s. Blum’s students studied the work of Helen Frankenthaler, Ellsworth Kelly, and Mark Rothko and others, and visited the Ferus Gallery in Los Angeles where her husband Irving Blum exhibited the work of these artists. After graduation Judy moved with her husband Jack to Seattle and worked as a registrar at the Henry Art Gallery, University of Washington where the Gallery exhibited many nationally -recognized contemporary artists. The Keenes moved to Maryland in 1975 for Jack’s postdoctoral fellowship and their son, Michael, was born. Judy worked as assistant registrar at the Freer Gallery of Art, Smithsonian, Washington, D.C., inventorying the collections of Asian and American art. In 1978 Jack joined the faculty of Duke University and the family moved to Durham where they have lived ever since. After second child, Lisa, was born, Judy worked part-time for several years in the Conservation Department of the North Carolina Museum of Art and in addition to her duties as administrative assistant she researched pigments, materials and methods. In the late 80’s while caring for her family and aging mother, Judy was able to attend classes at UNC Chapel Hill with Professor Marvin Salzman and began to paint full time. In addition to painting abstracts she studied classical academic painting in workshops with Frank Covino, a Vermont artist, and in 2004, spent a month-long residency in Paris copying an Ingres portrait in the Louvre. Since then she has continued with workshops in landscape painting, most notably with Thomas Kegler at the Hudson River Fellowship in the Catskills. Jack’s scientific career has made it possible for the couple visit museums abroad and attend many exhibitions of the work of Veronese, Botticelli, Monet and all the exhibitions of Pierre Bonnard from his exhibition at the Phillips Collection in 1984 to his recent retrospective at the Palace of the Legion of Honor, San Francisco. They also visted the home of Joaquin Sorolla in Madrid, and Monet’s garden in Giverny. After eight years maintaining a studio at Golden Belt Arts, Durham, she now paints at home and is making plans for a new home studio. The Keenes have five grandchildren. Judy has exhibited in member and juried shows at the Durham Art Guild for many years and had three solo shows. Her work is in private collections in the U.S., France, and Japan. She continues to study the materials and methods of the Old Masters in her search for refined color harmonies.